The sequel hopes to establish a spectacular new legacy for the stealth genre. This article was originally published in PC Gamer issue 293. For more quality articles about all things PC gaming, you can subscribe now in the UK and the US. The great old houses of the stealth genre are enjoying a long indian summer. Deus Ex has held on to its core values even as it adapts to the mainstream, and the latest Hitman episodes have absolved the series of, well, Absolution. Thief has struggled—after such a long absence, 2014’s patchy reboot was a let-down—but we haven’t needed Thief, really, since 2012. Dishonored’s claim to that particular throne was strong from the outset. Soulful, clever and violent, Arkane’s new immersive sim revived the fantasy of the agent in the shadows. Yet Dishonored wasn’t special just because it resurrected an old legacy—it was special because it challenged it. Stealth games are always in some way about the fragility of power: in the dark you might as well be god, but exposed you’re just a person in formfitting leather. When Corvo Attano is granted his otherworldly powers near the start of the game, that changes. In the dark he is a god, manipulating minds and bodies—sometimes literally—to bring about his revenge. In the light he’s a terror, slitting throats with impossible speed and freezing opponents in time before feeding them their own bullets. If the stealth game was traditionally about having godlike power that could be taken away by a stray beam of light, Dishonored was a little more open, more of a sandbox—about having godlike power in either case but being responsible for the world you bring about. It wasn’t just about continuing an old legacy—it was about creating a new one. 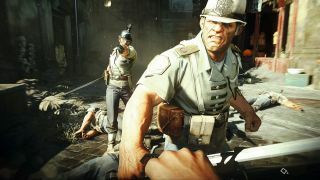 Set 15 years after the original game, Dishonored 2 is—in creative director Harvey Smith’s words—“the second half of the original story.” The assassination of Empress Jessamine Kaldwin at the beginning of Dishonored casts a long shadow. Jessamine’s daughter Emily is now 25 and Empress herself, and the game opens with you experiencing a day in her life in Dunwall, the setting for the first game. Then, perhaps predictably, something goes terribly wrong. Emily finds herself fighting back-to-back with her father, Corvo. (Arkane is being much more open about that particular detail this time around.) At this point you’re asked to choose: who do you want to control for the rest of the story? Karnaca is rotting from within—there’s sickness, corruption, and a stark divide between rich and poor. Luttrell and Russell are joined by a cast that includes Vincent D’Onofrio (Daredevil’s Wilson Fisk) as the Duke of Serkonos, Pedro Pascal as a gang leader, Sam Rockwell as a Dunwall city watchman, and Robin Lord Taylor (The Penguin in Gotham) as the new voice of the Outsider. Rosario Dawson plays Meagan Foster, captain of the Dreadful Wale—a hulking ironclad whaling vessel that the player uses as a base between expeditions to Karnaca. Like Dunwall, Karnaca is rotting from within—there’s sickness, corruption, and a stark divide between rich and poor. The new city presents these themes in a new way, however. This is (or was) an opulent southern colony of the Empire. Tall pastel terraces line a bay at the fringe of deep jungle in the shadow of a mountain. It’s a little bit Havana, a little bit Barcelona, a little bit British Raj. There are rats (this is Dishonored, after all) but no plague. Instead, perennial infestations of bloodflies (think giant mosquitos) are getting worse. They lay their eggs in corpses. As crime and corruption create more bodies, the situation worsens. This very much feels like a different place in the same world. Whale oil is a power source, but a less prevalent one than it was in Dunwall. In Karnaca, a cleft in the mountain channels wind down through the city. Here, walls of light and alarm systems are powered by turbines as often as explosive fuel. This impacts how you manipulate these devices and how they fit into the world. He gives the example of the Dust District, an area of Karnaca in the shadow of great pipes that funnel dust from mountainside silver mines down the wind corridor and out to the bay. It started with the idea of a poor area choked by dust due to over-mining. Mitton’s team, accounting for the impact of wind on city streets, created a system of diamond-shaped city blocks flanked by massive wooden windbreakers: the kind of solution an intelligent architect might have devised to solve an environmental problem. These designs then inspired the way the area plays: the inside of each windbreaker offers a stealthy aerial route for subtle players, while the prevalence of rooftop power turbines offers a clue to the best way to subvert ground-level security devices. With flat rooftops comes increased guard presence at higher levels, however, making vertical exploration less secure than it was in the previous game. Periodically a distant horn heralds an incoming dust storm, at which point the entire district is shrouded in visionand- noise-obscuring ochre dust, perfect for an infiltration or a killing spree. Many of these features are exclusive to the Dust District, which is only one of Dishonored 2’s dozen-or-so mission areas. The appeal of Arkane’s approach to worldbuilding isn’t just that they tailor the environment to offer specific opportunities to the player—all stealth games do that—but that they carefully consider why a city would be the way it is. These places are as impressive as they are because they emerge from a feeling and a sense of history as much as a game design need. Arkane is using a new engine (Void Engine, based on id Tech 5) to enable better lighting and post-processing effects. Even so, Dishonored 2 is very much led by the same painterly sensibility as the first game. It’s a much better-looking game, but strict realism isn’t the goal—although some screenshots are surprisingly easy to mistake for concept art. Watching the Dust District mission play out in several ways, one thing that strikes me is the sense of heat. “Some senses work well in games,” Mitton says. “You have visual, sound, the vibration of your pad, but you miss the smell, the cold or the heat... It falls where?